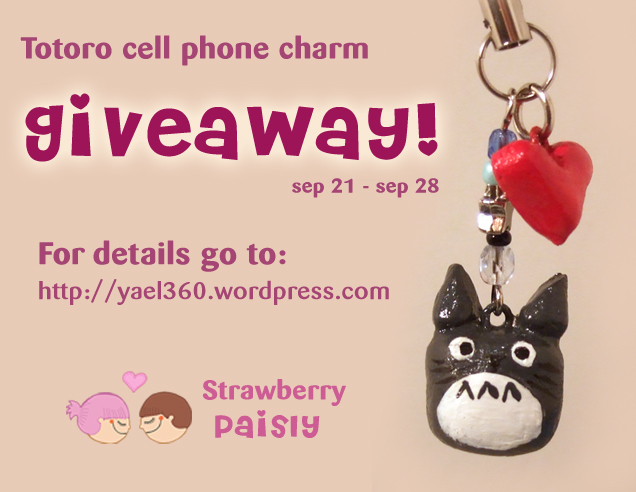 The winner will be chosen at random, on Sep, 28! The winner will receive an e-mail and will be announced here! This entry was posted in Uncategorized and tagged charm, clay, contest, free, giveaway, giveaways, heart, kawaii, totoro by yael360. Bookmark the permalink. The crazy cute emo/punk bunny bag is my favorite item in your Etsy shop! I would have to say that my favorite item in your store is the Totoro Cellphone Charms(All colors). I couldn’t become a fan of you Facebook Page, so I joined your group. Wow, this is a really good idea! ^__^ It gives me ideas on future contests I could possibly hold. the plaid evil bunny bag. I became a fan of your Facebook page. I’m in love with the evil bunny plaid bag! Hi!!! I Love ALLLL of your stuff on etsy!!! You’re SO talented. I joined your group on facebook and said “HI” I will PROUDLY display your totoro charm on my cell if I happen to win. Keep up your beautiful artsyness!! Okies, joined your Facebook Group ^^ I was the 15th member. I became a fan of your facebook group too. I LOVE all your stuff! kataang500 at gmail dot com. I love the totoro charms in your shop, I really love all the colors, but pink might be my favorite. I also love your embroidered bags! Everything is so cute, it’s really hard to choose. Joined your group/followed you on facebook. All your charm are very beautiful and bunny bags tooo cute but as a fan of Miyazaki I fell in love with :”Grey and pink kodama / princess mononoke pencil purse”. I am a follower of your blog ! I joined your Facebook group! And I joined your group on facebook. I love your Totoro charms! I love that movie! It’s one of my favorites. I really like the grey totoro and soot cell phone charm. My friend would love these!!!! I really like the Cute Plaid Bunny bag (http://www.etsy.com/listing/54986925/kawaii-cute-plaid-punny-bag)! I love the Totoro charms/necklaces! I have been searching for the perfect gift for a friend of mine (she’s a big Totoro fan) and came across your Etsy shop. I’ve recently become a fan of Etsy and am now hooked! I’ve become a fan of yours on Facebook and now will definitely follow your blog as well as frequent your Etsy shop! Your totoro keychains are sooooooooooooo cute!!! You’re out on vacation and I can’t exsplore your shop, but I hope you enjoy your vacation! !